After a pretty pedestrian two weeks in between the conference championship games and Super Sunday, the day of days has finally arrived. 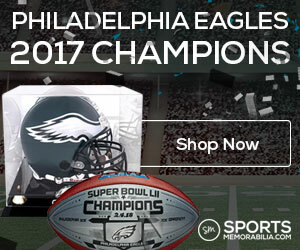 The Eagles are trying to win their first NFL championship since 1960 and the franchise’s first Super Bowl. New England is aiming to become the first team to repeat since…….they did it at the end of the 2004 season against these same Eagles. 6:15PM – Pregame introductions are complete as the Eagles enter the field as the conquering heroes while the Patriots enter to 1996 Hulk Hogan NWO heat. 6:28PM: Patriots win the coss toss and defer. They want that classic Patriots double score action. Early advantage to the Patriots assuming the Eagles don’t ram the ball down their throat immediately. 6:40 – New England’s Eric Rowe, who is starting for Malcolm Butler, gives up two third down receptions. Pretty evident the Eagles are going after him on third down plays. 6:41 – A long drive concludes with a short field goal as Rowe breaks up a pass in the end zone intended for Alshon Jeffrey. 6:43 – Not many surprises on that first drive. 6:48 – Brady to White on a second down play for 15 yards. That’s followed by the Eagles with a 12-men on the field penalty. 6:53 – Patriots move quickly down the field but Brady tries to jam a throw into the end zone for Gronk and it gets broken up. FG time for Stephen Gostkowski. 6:59 – Eagles go right back down the field in three plays thanks to a LeGarrette Blount run. Foles to Alshon Jeffrey again over Eric Rowe for six, who is taking a world class beating in this game so far. However…Jake Elliott misses the extra point. 7:08 – Patriots take over deep in their own end. Brady throws back to back ducks while being pressured. Unfortunately for the Eagles, the second falls into the lap of Danny Amendola who takes it for a long gain in Eagles territory. Pats on the stroll again at the end of the first quarter. 7:13 – Brandin Cooks can’t hurdle Jalen Mills to get a 3rd and 2. Field goal time….however, a botched snap leads to a Gostkowski miss. Big bullet dodged by the Eagles. 7:20 – Eagles go three and out after a punt. However, the game’s first big injury takes place. Brandin Cooks makes a first down catch and gets blindsided by Malcolm Jenkins. 7:26 – Bad drive for the Patriots. Cooks gets knocked out and then on a 3rd and 5 from near the 35 yard line, Brady can’t make the catch on a trick play. 7:28 – Pats miss on 4th and 5. Everything turning up Eagles so far. 7:31 – LeGarrette Blount hits another big run on the Eagles for six following another good grab by Jeffrey. Patriots are in trouble. No Cooks. No stops. Although, the Eagles can’t connect on a two-point play. 7:38 – Brady hits Rex Burkhead on a 47-yard play but once again, the Eagles defense holds on another third down stop. Gostkowski knocks this one through. 7:45 – The Patriots finally catch a break. Following another backbreaking third down, Duron Harmon picks up New England’s first turnover since??? His Week 15 pick of Ben Roethlisberger in the end zone. 7:51 – Brady hits Chris Hogan on a majestic bomb downfield on a 47-yard pass. It leads to a TD by Mr.
8:03 – Patriots are in big trouble. They hit Corey Clement on a 55-yard wheel route. Then, on a 4th and 1, they run a trick pass play to Nick Foles for a TD. Wonderful call. 8:10 – Patriots got into the locker room down 10 and are reeling. They’ll need to play their best half of the season to win this one. 8:46 – Patriots go down the field in short order thanks to four catches by Rob Gronkowski, who finishes the drive with a touchdown. We have a game again kids. 8:47 – The big question is will New England’s D show up? 9:00 – NOPE. Safety Patrick Chung gets knocked out. Corey Clement hauls in a 25-yd TD catch…but appears to be juggling the ball. It’s under review. 9:03 – Incredibly, the NFL, who calls nonsense on almost any contested catch gives that one to Clement somehow. Clearly, he didn’t have complete possession of that pass. 9:13 – Brady is going postal on the Eagles D. Another drive culminates with a touchdown to Chris Hogan. Somehow, New England is still in this game. Brady is already over 400 yards passing on the night and we’ve got a ways to go. They should be down by 40. 9:16 – Patriots are on the ropes yet again defensively…. 9:26 – For some reason, on a 3rd and 3 deep in NE territory, the Eagles opt to throw in the flat Nelson Agohlor and gets dropped for an eight-yard loss. Jake Elliott boots one in from 42-yards away. 9:35 – Brady is trashing the Eagles D. Another drive for six and it culminates in a second Rob Gronkowski touchdown. The Eagles better figure this out in the next nine minutes. They are dying a rapid death. For the first time tonight, the New England Patriots have a lead in Super Bowl LII. 9:46 – Eagles are forced to go for it on 4th and 1 from near midfield with under six minutes left. They get it barely on a throw to Zach Ertz. 10:00 – Foles to Ertz for 6 to take the lead after a super lengthy review. Eagles back on top but you know who is getting the ball. 10:10 – Incredibly…the Eagles get a stop…AND IT’S A STRIP SACK. Brandon Graham forces a Brady fumble and barring a shocking reversal of fortune, the Eagles are poised to win their first NFL championship since 1960. 10:15 – Eagles tack on a field goal for some extra insurance. Now, the Patriots need to go the length of the field to score a TD AND get a two-point conversion in less than a minute. Brady is good but he is not otherworldly. 10:20 – IT’S A WRAP. The Eagles top the defending Super Bowl champions as Brady’s hail mary attempt falls just short. SUMMARY: Tom Brady throws for 505 yards and 3 touchdowns…AND LOSES. Sometimes, it’s just not your year and that was the case with the Eagles. They survived everything thrown at them. Now, they are Super Bowl champions. Meanwhile, somebody needs to explain what happened to Malcolm Butler. Just doesn’t add up. Anyhow, the 2017 NFL season came down to Nick Foles being a better receiver than Tom Brady. Go figure.